I've found a new favorite lipgloss, and it hails from the land of Lipstick Queen. Because, let's be honest, who doesn't want to swipe on a gloss named Fifteen Minutes of Fame Pop Art Gloss? 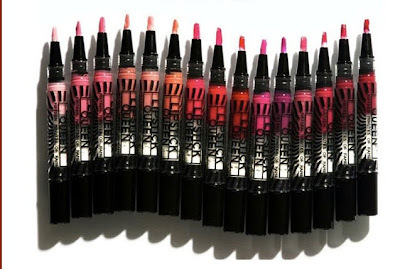 These fabulous glosses, created by the equally if not more fabulous Poppy King, were inspired by Pop Art prince Andy Warhol. His prediction in 1968 that "In the future, everyone will be famous for 15 minutes," inspired Poppy to create a collection of -- you guessed it! -- 15 glosses named according to the minute. They deepen in intensity with every passing minute, ranging from the palest pink to the deepest red. I'm totally in love with 4 Minutes, which makes my pout turn a gorgeous creamy nudish pink. It's the perfect everyday lipcolor. Lipstick Queen Fifteen Minutes of Fame Pop Art Gloss retails for $18.